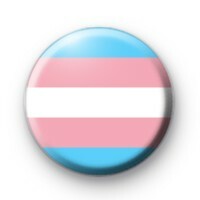 This listing is a pink, blue and white Transgender Pride Flag Badge. This LGBT is great for pride events and showing your support to the community. We have a great range of gay pride badges, bisexual pride badges, lesbian & gay badges and LGBT pride badges available on the website. Have a browse through our gay pride badge section for our other designs. Standard 25mm button badge made by hand in the UK.